Welcome to the The Wild Southwest - A post-apocalyptic, Western Australian role playing setting. 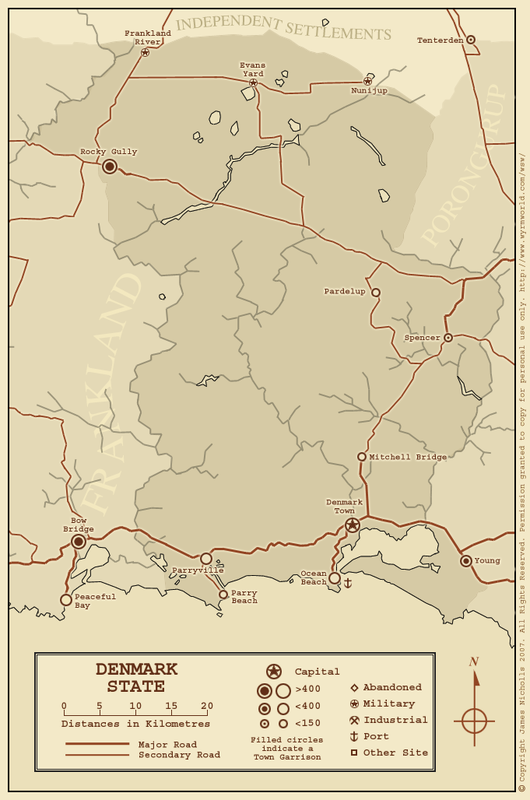 The Wild Southwest is set in the south western corner of Western Australia, roughly 80 years after an apocalyptic worldwide conflict known as the Great War. Civilisation has re-established itself, and the majority of people can (usually) live lives of relative safety - if not exactly comfort. But for those who seek something more exciting, the opportunity for adventure abounds. Downloadable resources will be added to this page as they are developed. In the meantime the following files are provided for the players in the current campaign, and for curious onlookers. Story_So_Far.pdf - What's occurred so far in the current adventure (Note: The Adventure page is a slightly more polished and detailed presentation of this information). WSW_Introduction.pdf - A general introduction to the Wild Southwest. WSW_Technology.pdf - A guide to the technology of the Wild Southwest. WSW_Creatures.pdf - A guide to the creatures of the Wild Southwest. WSW_Currency.pdf - The currency of the Wild Southwest. WSW_Terminology.pdf - Common terms and slang of the Southwest. WSW_Resurgam.pdf - The PRS Resurgam - Most powerful warship in the Southwest. Borden_Televisor.pdf - The Borden Televisor (the most trusted paper in the Settlements) for June 10th 2094 (Borden dating). While the master map of the Southwest is the Google Earth file (found below) you'll probably want something a bit more printable. A series of maps detailing the whole Southwest are in preparation, and will be added to this page as they are finished. 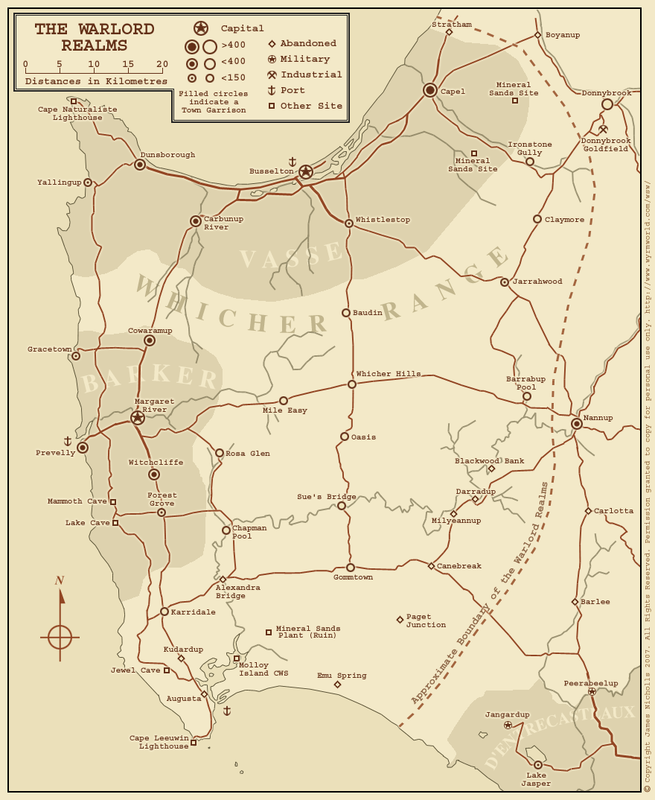 map_overview.png - An overview of the Southwest. map_warlords.png - The Warlord Realms (330k). 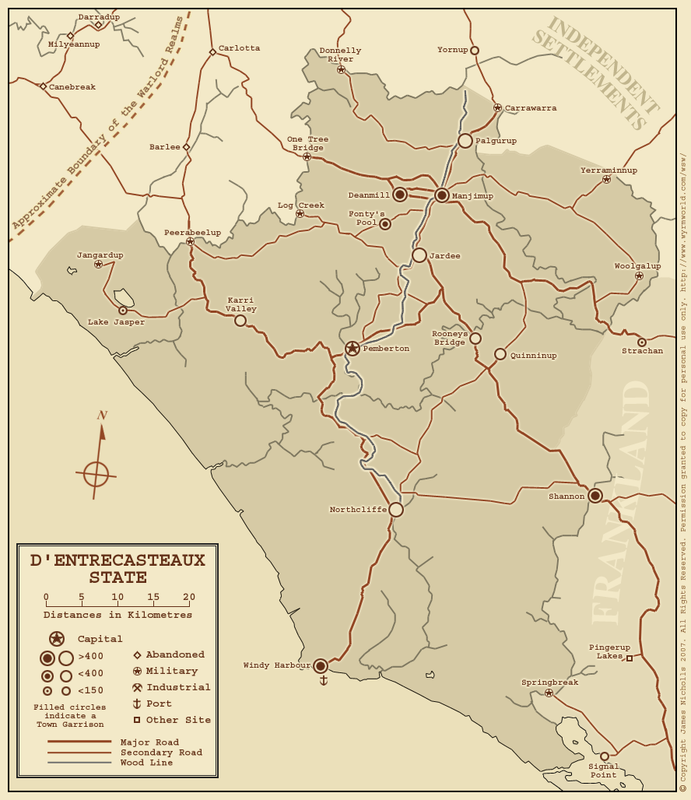 map_dentrecasteaux.png - D'Entrecasteaux State (330k). 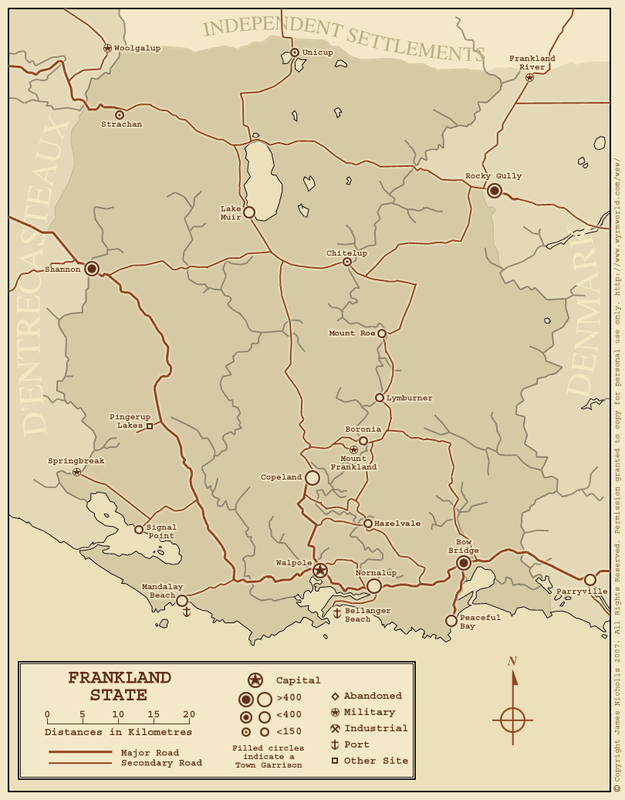 map_frankland.png - Frankland State (298k). map_denmark.png - Denmark State (231k). 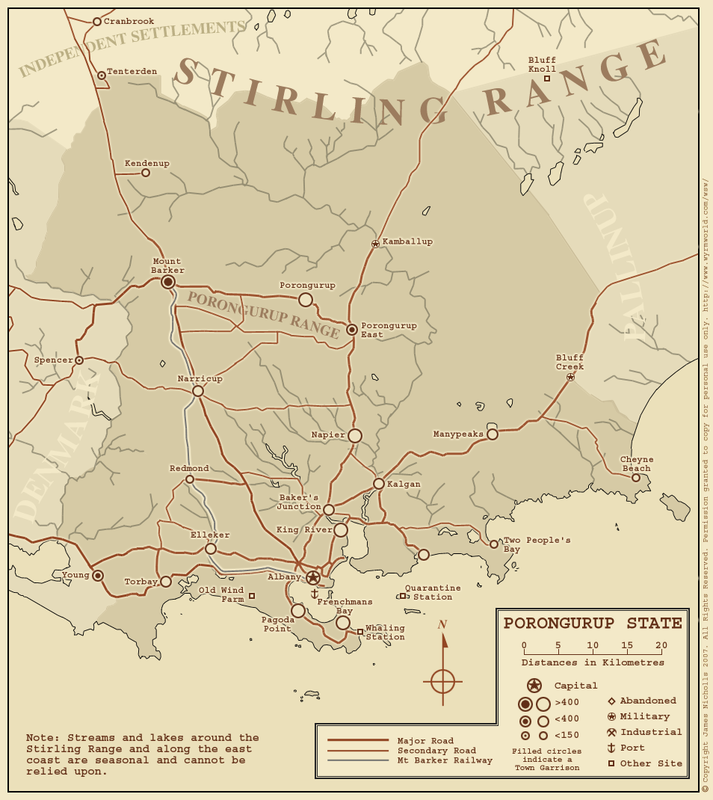 map_porongurup.png - Porongurup State (393k). 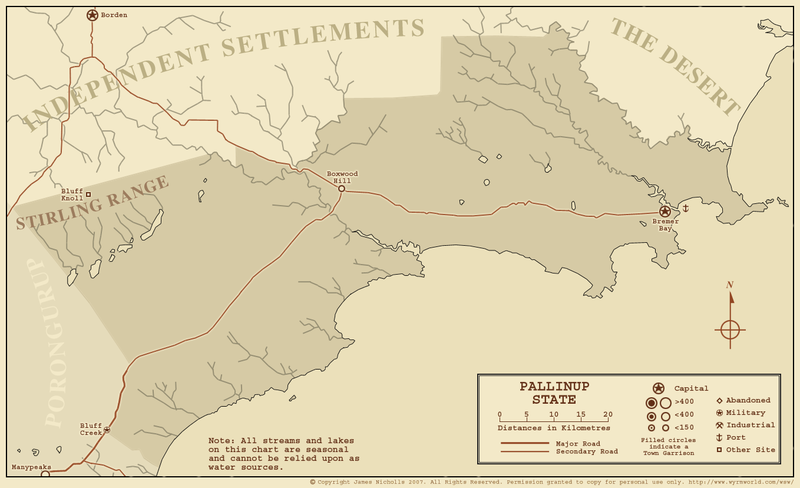 map_pallinup.png	- Pallinup State (260k). 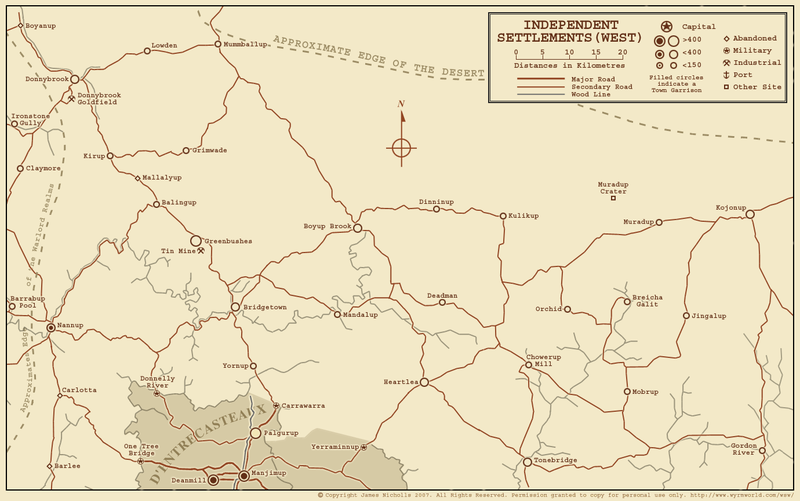 map_settlements_west.png - The Independent Settlements (West) (306k). 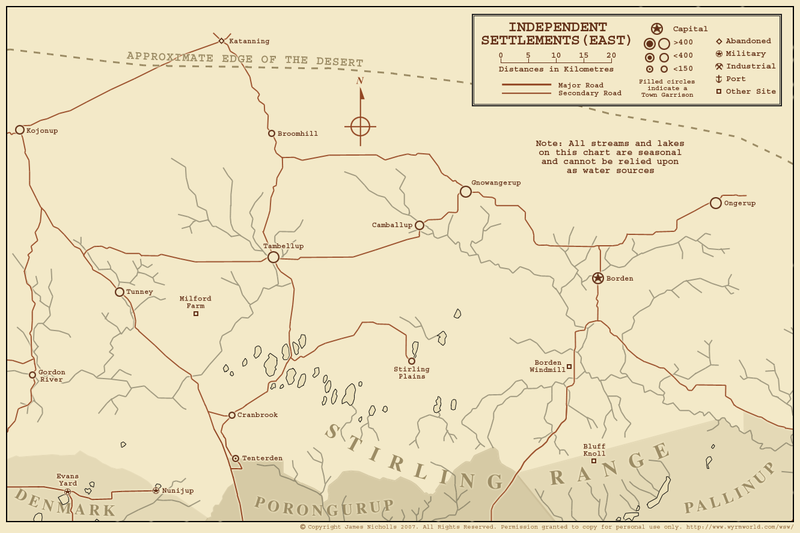 map_settlements_east.png - The Independent Settlements (East) (283k). The ultimate map of the Wild Southwest is this Google Earth file. Load it into your copy of Google Earth, and go exploring (you'll probably want to turn off all the other data layers first - otherwise it can get pretty confusing). Every major settlement in the Southwest is marked along with its population. Many markers can be clicked to bring up additional information - you can recognise these by the fact that they're labled in white. Sealed roads (maintained to an almost pre-war standard with great effort) are marked in red. Secondary, unsealed roads are in yellow. The Mount Barker railway, and the D'Entrecasteaux Wood Line are blue. Updated versions of the file will be posted periodically. Credits © Copyright 2007 James Nicholls. All Rights Reserved.